Plants perennial, densely tufted. Rhizome shortly creeping, thick. 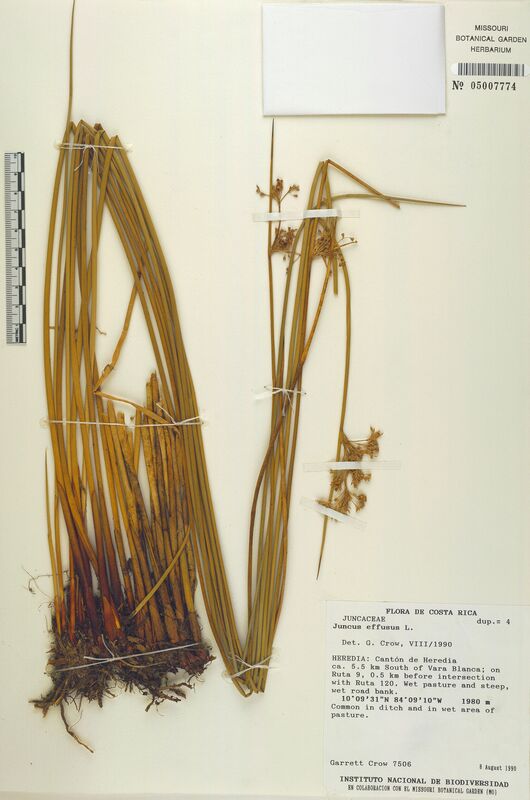 Stems terete, 25--90 cm or taller × 1--3(--4) mm, striate; pith continuous. Cataphylls closely embracing stem, reddish brown to chestnut brown, sheathlike, 2--22 cm. Inflorescences pseudolateral, densely to laxly many flowered; involucral bract erect, seemingly a continuation of stem, terete, 5--28 cm. Perianth segments usually pale brown, linear-lanceolate, 2--2.7 × ca. 0.8 mm, unequal with outer ones slightly longer than inner, apex acute. Stamens 3(or 6), ca. 2/3 as long as perianth; anthers 0.5--0.7 mm, slightly shorter than filaments. Ovary 3-loculed. Style very short. Capsule ovoid to oblong, slightly depressed or not, subequaling or slightly longer than perianth, 3-septate, apex obtuse. Seeds ovoid-oblong, 0.5--0.6 mm, reticulate. Fl. Apr--Jul, fr. May--Sep. 2 n = 40, 42. The pith is used as a wick for oil lamps and candles, and also medicinally as a diuretic and tranquilizer. Forest margins, wet grasslands, pools, morasses, lake margins, river banks, fields, rice fields; 200--3400 m. Anhui, Fujian, Gansu, Guangdong, Guangxi, Guizhou, Hebei, Heilongjiang, Henan, Hubei, Hunan, Jiangsu, Jiangxi, Jilin, Liaoning, Shandong, Sichuan, Taiwan, Xizang, Yunnan, Zhejiang [Bhutan, India, Indonesia, Japan, Korea, Laos, Malaysia, Nepal, Sikkim, Sri Lanka, Thailand, Vietnam; widespread in temperate and montane-tropical regions].